You are here: Home / Home Feature / News / LSU Greek Life Reform: Justice or Punishment? 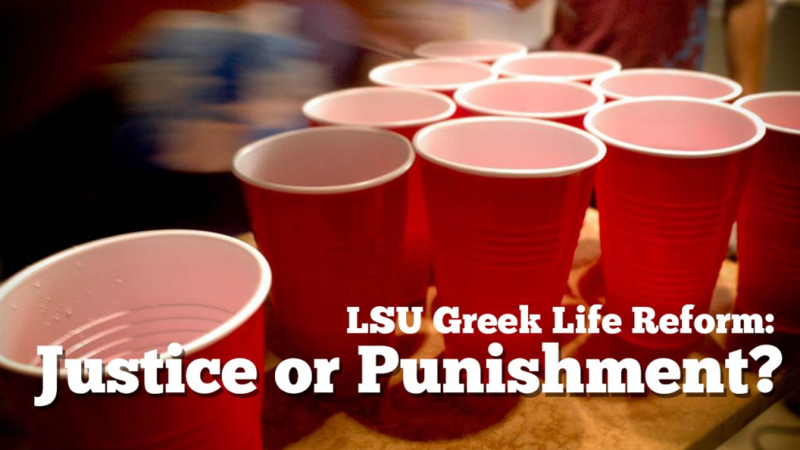 LSU Greek Life Reform: Justice or Punishment? Stepping foot on campus for the first time is a daunting experience for many undergraduate freshman. The familiar comforts of high school are almost all but gone, as most students come face to face with a myriad of realities sans mommy and daddy. Plenty of graduates can recall some of their repressed memories from freshman year; such as awkward interactions with their dormitory roommates, and the painful intimidation of sitting in a class surrounded by hundreds of strangers. Despite these growing pains, the freshman experience offers students a bounty of opportunities to explore as they begin the next chapter of their lives. At the forefront of these opportunities is Greek Life, the ubiquitous hallmark of Universities across the United States. While the appeal of fraternities and sororities fails to resonate with some, the glorification of Greek Life in American society draws droves of freshman to the doorsteps of several houses adorned with various Greek letters. Students lucky enough to earn a bid to a fraternity assume the duties of a pledge, and face a semester of hazing which acts as a litmus test for those worthy enough to join the brotherhood. However, this tradition has come under serious national scrutiny, as the means of hazing has devolved upon which pledge can consume the most alcohol. In the past decade seventeen pledges have died from hazing, nine of which were caused by alcohol poisoning. Amongst the nine deaths caused by alcohol poisoning is LSU student, and Phi Delta Theta pledge, Maxwell Gruver. On the morning of September 14th, Max was rushed to Our Lady of the Lake Medical Center after participating in a hazing ritual known as “Bible Study,” where pledges were forced to drink 190 proof liquor if they failed to answer questions about the history of the fraternity. The tragic death sent shockwaves throughout the LSU community, lamenting the loss of a fellow classmate in only his first month of curriculum as a Mass Communications major. LSU President, F. King Alexander, issued an immediate response by suspending all Greek activities on LSU for a week, which subsequently lead to significant school policy changes to the Greek system. LSU Director of Greek Life, Angela Guillory, warned students that, “we aren’t just thinking about changing the rules; we are thinking about changing the culture.” This has proven to be quite significant for a student body of 31,414 students, of which 23 percent are members of a Greek organization. The changes implemented since have been widely criticized by students in Greek organizations, who feel as if they are being punished for activities they have never condoned. “It’s like being punished for something your little brother did,” an anonymous member of Kappa Sigma explained, “it’s not fair for the people who follow the rules.” This concern is also echoed by other Greek organizations, who fear that their organizations are being targeted and vilified. Despite the unrest amongst LSU students involved in Greek organizations, the hardline approach by the LSU administration has been seconded by Governor Jon Bel Edwards, who has called upon all state University Systems to conduct a review of their policies on hazing and binge drinking. The concerns of justice only add more frustration to a scenario where many are simply left with a throw hands. With all the uncertainty surrounding the death of Max Gruver, it’s easy to lose sight of the major issue at hand. A young adult lost his life in an unfamiliar realm, under despicable circumstances. However, there is no doubt that Max Gruver will not be the last victim of hazing, as it takes many forms above alcohol poisoning. Perhaps then, a degree of responsibility should fall upon students stepping foot on campus for the first time to understand the dangers of hazing.